That being said, it must be admitted… I do not win the race for a title. Dooce won hers, but in this house, E has been saying “Dadadaddada” for many of his waking hours the last two days. He doesn’t even make an mmm sound, try as I might to encourage him. Oh well, I’m not bitter. I get other things. Like when I was away for eight hours (the longest I’ve ever been apart from him) on Saturday and E had fun with Daddy but when I got home, he was visibly excited to see me and got all jiggy with his legs. It was awesome. Yes. What a lucky mama you am! Perhaps E’s merely showing rudimentary dadaist propensities…. Definitely. He’s so anti-bourgeois. But pro-auntie. I’m with you on this, Caroleigh! 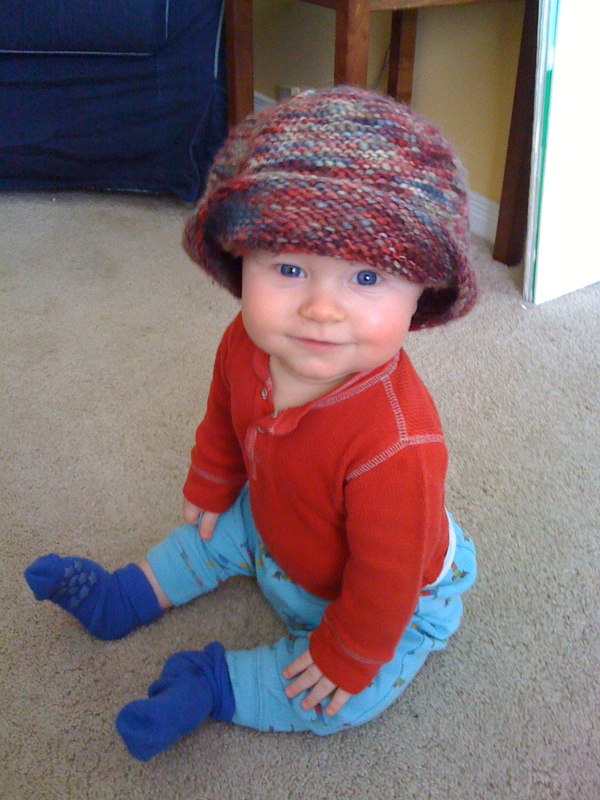 Aah, the hat – the hat is an accessory already – look at the SITTING UP! Pretty talented.